Kids love playgrounds. They’re fun, they create social interactions, and research shows they can play a significant role in child development. 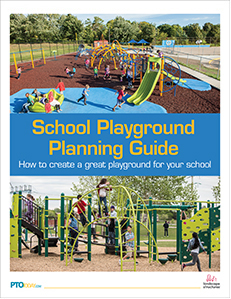 This school playground planning guide will help you make it happen at your school! We know playground projects can be daunting. Whether you’re considering building a new playground or adding playground equipment to an existing one, this guide walks you through all the important steps in planning and executing your project. You’ll learn how to build support, select a vendor, raise money, and coordinate the installation, plus get an inspection checklist, planning checklist, and tools to promote the grand opening of your new playground! By downloading this free guide, you accept that your email address will be shared with our program sponsor. What Does a School Playground Project Involve? Playgrounds are among the most expensive projects for PTOs, so it’s important to research your options carefully. If there’s an existing playground at your school, your first step is to give it a close inspection. Grab a clipboard and pen and head on over. Does it need a complete overhaul? Is it in good shape but could use some new equipment and a bit of sprucing up? Take careful notes—they’ll help you build a case for your project. A member with expertise in construction. This could be a parent who owns or manages a construction company. A member with expertise in recreation. At least one parent of a child with a disability to advise on accessibility issues. A community representative, especially if your playground will be open to the community outside of school hours. For your project to be a success, you’ll need the support of the school community, school officials, and the larger community. Make the case for why the school needs a new playground and what its benefits will be. Enlist opinions and advice from others so they’ll feel personally invested in the project. A good estimate for a typical playground project is six to nine months from the start of planning until installation, not including fundraising. Be aware that glitches are not uncommon with construction projects, so keep your timeline flexible. Detailed points to assess the surface, equipment, and location of your existing school playground. How to find community members to support your project, create a timeline, and get students involved. Why school playgrounds are important and how to share that message. 6 key discussion points to make sure the end result works for all students and can be maintained for years to come, plus a checklist to help determine your needs and build support. Researching companies, soliciting bids, asking important questions before you buy, and making a final decision. Tips for finding grants and cutting costs. Installing your school playground and celebrating with the community!